Stephen Strasburg is coming back. 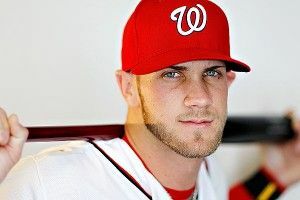 Bryce Harper is coming soon. The Phillies might be waning. No wonder the Nationals were one of baseball’s most aggressive teams this offseason, raiding the farm system for Gio Gonzalez and signing Edwin Jackson to a deal that might turn into the best bargain of the winter (one year, $11 million). Two weeks ahead of Opening Day, that leaves the Nats with what could be a top 10 (or even top five) starting rotation, but also an offense that’s still full of holes. Early rumors of a possible Prince Fielder signing died out quickly, leaving Adam LaRoche as one of the worst starting first basemen in baseball. Ditto Roger Bernadina in center after Bryce Harper got sent back to the minors. The Nationals could be interesting this year, maybe even contend for a playoff spot. But they’ll need to do better than this Opening Day lineup to make that happen. As bad as first base and center field look right now, several returning starters from last year could weigh down the offense too. The Nats finished 25th in on-base percentage last year, yet Desmond (.253/.298/.358) returns as the starting shortstop; that the Nats might lead off with Desmond would only make matters worse. Espinosa and Ramos both bring above-average pop for their positions, but both are prolific out-makers too. The silver lining is that all three players are still young: Desmond’s 26, Espinosa’s a month away from his 25th birthday, and Ramos is just 24. All things being equal, better to bet on flawed youth than flawed, aging veterans. Keep an eye on Zimmerman and Morse too. Zimmerman averaged 59 games missed in 2008 and 2011, but just 13 in 2009 and 2010; if the Nats get the latter, that’ll help a lot. Morse is a tougher case, coming off a monster season (31 homers, 36 doubles) that far exceeded anything he’d ever done before. An optimist would say it was merely a continuation of 2010’s strong showing, prorated to 146 games; a pessimist would note that for every Jose Bautista who can build on that kind of huge breakout, there are 10 players who regress significantly the next year. The defense remains an open question. The Nats ranked just 22nd in UZR last year and didn’t make any significant defensive upgrades over the winter. Harper could be a big plus over Bernadina offensively if and when he takes the starting job, but Harper’s impressive tools might not be enough to make him a plus defender given his inexperience in center field, at least not initially. The Nats may well live to regret trading Brad Peacock, A.J. Cole, Derek Norris, and Tommy Milone for a lefty starter who’s ranked among the league leaders in walks in the past two seasons and benefited from the spacious confines of whatever it is Oakland’s stadium is called now. But Gonzalez has been called overrated so many times, he might be a tad underrated. He struck out nearly a batter an inning in 2011, has missed just one start in two years, and sports above-average ground-ball and pop-up rates. We could be looking at a 4 WAR (or better) starter this year, and those types are tough to find. The biggest question mark, of course, is Strasburg. That ZiPS projection (Bill James didn’t even have a projection given Strasburg’s limited major league track record) accounts for the fireballing righty’s recovery from Tommy John surgery. TJ recovery rates have improved dramatically over the years, such that Strasburg could well make 30 starts this year. If he comes anywhere close to that sub-3.00 FIP projection with that many starts, the Nats are going to break a lot of hearts with that top four. The bullpen could play a big role in effectively managing the starters’ workloads. Drew Storen and Tyler Clippard form a young, effective tandem in the late innings, while Brad Lidge was a worthy spec play at 1/14th the cost of similarly damaged veteran Joe Nathan. Trading away some of that pitching depth to acquire Gonzalez could hurt the Nats’ ability to staff the rest of the pen, though — Peacock especially might’ve been ready to contend for a job. Strasburg. A no-duh pick, given his immense talent and the potential to pitch more than 68 innings for the first time at the big league level. The difference between 12 Strasburg starts and 32 could be enormous — three wins or more for Washington. The Nats ride their starting pitching strength into contention by the All-Star break, bring up Harper, then dip into the Lerners’ deep pockets to fill out the roster. The result is Washington’s first playoff berth since the Senators won the pennant 79 years ago. Too many lineup holes, not enough defense, and Strasburg slower to return to full strength than expected add up to a fourth-place finish. This team is going to be very good eventually, but it might not happen just yet. Let's Talk About the NCAA Tournament!